Explorer, writer, and cartographer John Smith assumed the presidency of the Jamestown settlement on September 10, 1608. The charismatic and controversial Smith was initially excluded from the government of the settlement on grounds he conspired to mutiny en route to Virginia. His comrades' suspicions notwithstanding, Smith became the de facto leader of the colony during the difficult winter of 1607 and 1608, which visited disease, starvation, and frequent raids upon the settlement by Native Americans. A brash and boldly self-confident figure, Smith brought years of soldiering experience to the Virginia venture. While fighting the Turks in Transylvania, he was wounded, captured, and sold, he claimed, into slavery in Turkey. Smith reported that he eventually escaped with the assistance of a Turkish woman who had fallen in love with him. All this before his adventures in America! 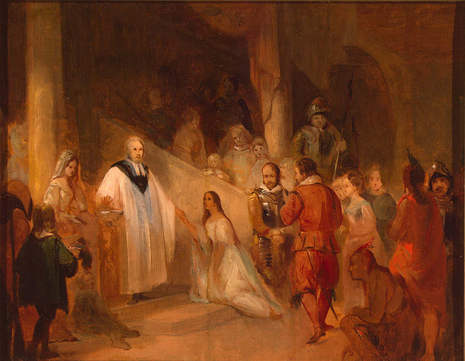 Whether or not Smith's reportage was accurate, his version of his role in the survival of the Jamestown colony was accepted as fact by subsequent generations of Americans. In Virginia, Smith led the settlers' resistance against frequent raids by the Algonquin Indians who made their homes in the Chesapeake region. He also ventured into surrounding territory to forage for food, negotiate with Native Americans, and trade trinkets with them in exchange for corn. 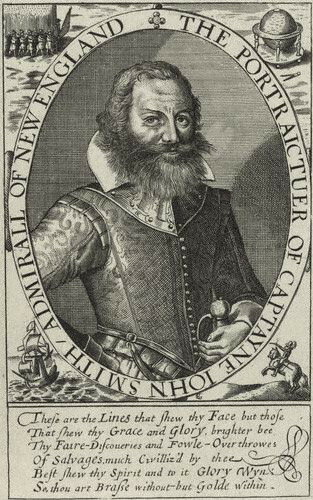 Captain John Smith (c. January 1580–June 21, 1631) Admiral of New England was an English soldier, sailor, and author. 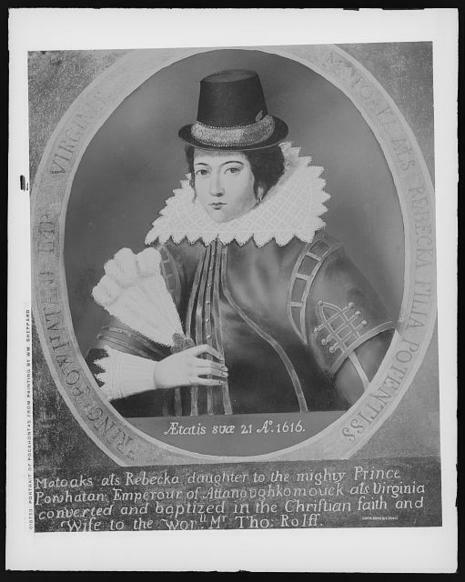 He is remembered for his role in establishing the first permanent English settlement in North America at Jamestown, Virginia, and his brief association with the Native American girl Pocahontas during an altercation with the Powhatan Confederacy and her father, Chief Powhatan. He was a leader of the Virginia Colony (based at Jamestown) between September 1608 and August 1609, and led an exploration along the rivers of Virginia and the Chesapeake Bay. His books and maps may have been as important as his deeds, as they encouraged more Englishmen and women to follow the trail he had blazed and colonize the New World. He gave the name New England to that region, and encouraged people with the comment, "Here every man may be master and owner of his owne labour and land...If he have nothing but his hands, he may...by industrie quickly grow rich." His message attracted millions of people in the next four centuries. — Copy of a Letter from Virginia the Councell [sic] to the Councell [sic] of Virginia Here in England, June 22, 1607.